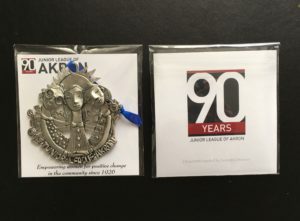 Trying to put 90 years of incredible Junior League of Akron history together conceptually into an ornament design was certainly a challenge! We began by turning to an exceptionally talented local artist Leandra Drumm, daughter of Don Drumm. Next, we knew the key element needed to be women coming together, working together, empowering each other which is depicted by the three ladies in the center. Notice that they are holding hands – these ladies are working hand in hand as a team to move their mission forward. These three ladies could also be seen as a Junior League woman in the center with her angel wings reaching out to give a helping hand to two other women in need. To the left of the women are small buildings – houses, businesses, and area organizations. These are homes filled with people in need, these are businesses the Junior League has brought together to help further our mission, these are organizations we have created or nurtured to help fill the needs that we see; these are our community. To the right is a beautiful flower, to show that the Junior League of Akron gives things a woman’s touch, that we don’t forget that life is beautiful and everyone needs a chance to share in that beauty, and that through our work everyone has a chance to bloom and grow. And lastly, on the top of the ornament is a rising sun. For many people in need, facing each day can be a bleak prospect. This sun is to remind us that for 90 years the Junior League of Akron has been bringing together the talents of its members to do remarkable things, to empower women for positive change in our community. This has been our guiding light, our sun, which we have shared with others. Looking to purchase an ornament? Simply click the link below!